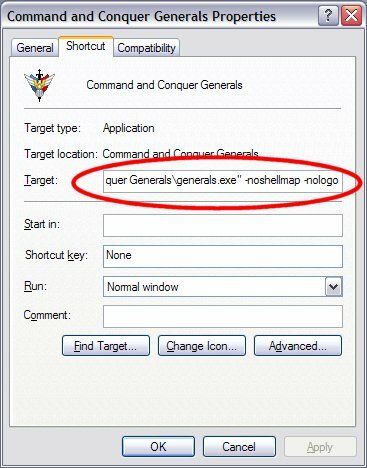 Right click on your Command & Conquer: Generals desktop shortcut icon then select Properties. After that click on the Shortcut tab and add -noshellmap -nologo to the target line. You should end with something as seen in the screen shot below. Once you have done that click on OK to close the Generals shortcut properties window. Now you can start the game with your Command & Conquer: Generals desktop icon which will now skip the EA and intro logos. The main menu for Generals will now display a picture of the shellmap (instead of the ingame animation) at the menus background. Menus will work alot smoother with -noshellmap active. This can be very handy for mod and map testing.